There are multiple different types of file systems a hard drive or removable media can be formatted. But which format is the best choice to use? It depends on the situation.our Windows system partition must be NTFS. 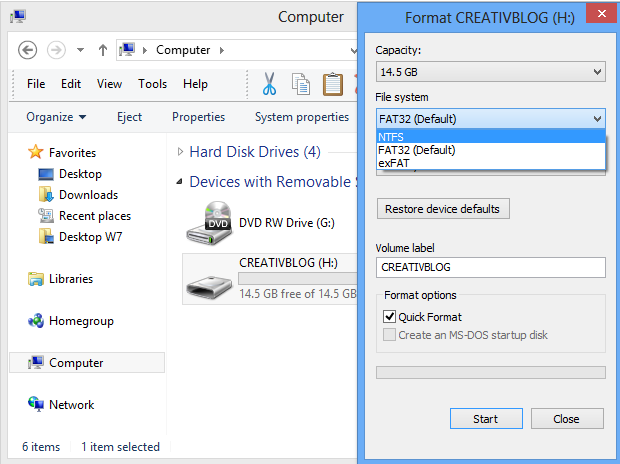 If you have a secondary drive alongside Windows and you plan on installing programs to it, you should probably go ahead and make it NTFS, too. NTFS is the modern file system Windows likes to use. When you install Windows, it formats your system drive with the NTFS file system. NTFS has file size and partition size limits that are so theoretically huge you won’t run up against them. NTFS first appeared in consumer versions of Windows with Windows XP. exFAT – exFAT is a propitiatory file system created by Microsoft for flash drives in situations where NTFS is not feasible due to its data structure overhead or file size limit of FAT 32. exFAT brings to max to 512 TiB, allowing files to be bigger than 4GB, and more features not in FAT formatted drives. It also increases the speed with which those files can be accessed. The exFAT file system not only facilitates large files for use of audiovisual media, it enables seamless data portability and an easy interchange between desktop PCs and a variety of electronic devices. A number of companies have integrated the file system into devices such as mobile phones, PCs, and cameras. ||ੴ||ਇੱਕ ਓਅੰਕਾਰ Satnam Shri Waheguru Ji A Web Blog about Product Review, Blogging Tips, Tech Reviews: Different Types of Hard Drive File system Format types.